Leeds United are certainly marching on together. Their 4-0 home victory against West Brom took them back to the top of the Championship table, for the time being at least. But going off the performance that Marcelo Bielsa’s side put in against fellow high-fliers, Leeds should harbour a realistic belief that this could be the season. It is on such evenings, against such opponents that this version of Leeds tend to deliver spectacularly. This was a titanic tussle featuring two of the most historic names in the English game, but it was the hosts who dominated from start to finish and gathered three valuable points in their pursuit of promotion to the top flight for the first time in 15 years. Built on a sturdy defence boasting an experienced goalkeeper, a dynamic and dominant midfield and an effervescent attack spearheaded by Patrick Bamford; this was a Leeds side marching in unison with all the trills and skills of the finest ensemble. Towards the Premier League they head, so it seems, and this crucially was a dent in another rival’s ambitions. It appears now the automatic promotion fight is down to three teams. At full time it felt rather churlish to say that prior to the 90 minutes Leeds were actually under slight pressure. Some may say that Leeds are always under some sort of pressure but only two wins out of five in the past month meant that there was an urgency for their form to pick up. Yet it is so often in the bigger matches that Leeds deliver, enhancing the statement being made. Scoring within 16 seconds most definitely lit the touchpaper and the fashion of Leeds’ latest win was apparent from the start. And that’s what it was, only the start. The beginning of a blitz and a display full of passion and positivity. Pablo Hernandez’s drive from 25 yards whistled past Sam Johnstone in the West Brom goal and lifted the home supporters off their seats no sooner after they had settled in them. Bielsa made the point post-match that had Leeds not scored so early, their performance would have still been as ferocious and tenacious as it turned out to be. Whether that is true or not, there was certainly an energy that came from the remarkable start that ceased to relent throughout the preceding 89 minutes. The high-energy approach that Leeds’ deploy has been raised as a possible reason for their inconsistency in recent weeks, but there were no signs of fatigue here. There was an intensity to their play that most Premier League sides would struggle to match – and that with Leeds having already navigated 35 games of the notoriously challenging Championship marathon. Mateusz Klich and Tyler Roberts pressed relentlessly, forcing West Brom into a compact shape and limiting them to the wide areas. The problem for Darren Moore’s side was that on the wings, Leeds also had the dynamism to cause concern. Jack Harrison and Hernandez weaved and manipulated the West Brom full-backs time and again, passing intricately and swinging balls both to good effect. Considering that Leeds were without one of their star players this season in Kemar Roofe due to injury, it is scary to think that it could have been even worse for West Brom had their former player been fit to face them. The visitors were coming off the back of eight victories in their last nine away matches in the league, but were unable to muster any sort of sustained pressure on the Leeds goal. 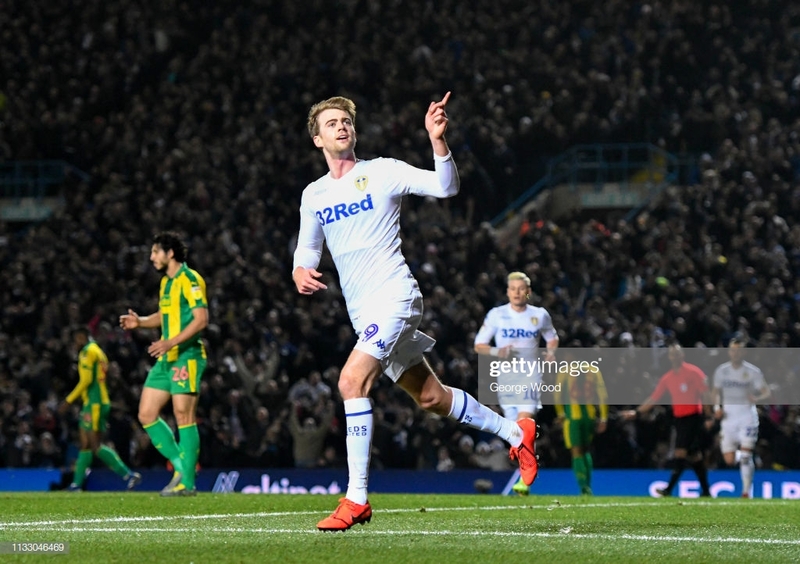 If Hernandez’s early strike had provided the showstopper then Bamford’s double that followed displayed the classier, more delicate side of Leed’s play. His first was calmly dispatched from close range following a neat piece of buildup play and after the hour mark, the former Chelsea and Middlesbrough striker scored a second when his shot was deflected past Johnstone into the Albion net. But it was Bamford’s display beyond the goals that really shone on a cold evening in West Yorkshire. The positivity that he showed, the confidence and ambition that coated his touches were evident and signified a player who was enjoying himself and the occasion. He drove Leeds forward constantly and demonstrated that he can indeed be the focal point of a ‘too hot to handle’ attack. He was supported superbly by Roberts who not only played a key part in both of Bamford’s goals but also produced an inventive and irrepressible play in the inside right channel. Whether it be a case of being overrun or overwhelmed, West Brom struggled from the outset to quell the fast approach that their opponents threw at them. By the end the visitors left defeated and demoralised, with their hopes of automatic promotion substantially dented. Barring a ten-minute spell at the start of the second half, Moore could only watch on as his team barely mastered a string of passes amongst themselves. It was a case of grin and bear it, or just bear it when Ezgjan Alioski tapped in the fourth in stoppage time. Affected by the atmosphere? Possibly, and Leeds will hope to use such emotion as they reach the climax of another enthralling Championship season. It is a weapon that increasingly fewer clubs have; the ability to make their home a cauldron and the pitch a bear-pit in which they thrive and their opponents suffer. Jay Rodriguez forced Kiko Casilla into a decent save with a fizzing shot from distance and Hal Robson-Kanu headed over the crossbar from a Gareth Barry inswinging free-kick but that was all that the visitors could offer in attack. Much of their energy – and time – was spent in trying to stop the positive driving force of Leeds in their tracks but they couldn’t, and few will if they continue to perform like this.